When contemplating installing a new hardwood floor inevitably a homeowner is faced with comparing the pros and cons of solid hardwood flooring versus engineered hardwood flooring. Each type of wood flooring product has its unique advantages and disadvantages so the decision can be tough. Solid hardwood flooring vs engineered hardwood flooring, for example, comes in many types of wood species including exotic ones, and is much more accommodating for refinishing many times. Consequently solid hardwood flooring can last for many decades with proper installation and maintenance, and can even be argued for this reason to be more of a green product than engineered hardwood flooring. Solid wood flooring, versus hardwood flooring, as a result is often better for high traffic areas and for homes where there are children and pets. Solid hardwood flooring, however is typically more expensive than engineered hardwood flooring. In addition, solid wood flooring, versus engineered wood flooring, is highly sensitive to moisture. As a result, in many cases homeowners shy away from installing solid hardwood flooring in bathrooms, kitchens and basements. This said, with the proper installation of a vapor barrier over the subfloor and attention to regular maintenance, solid hardwood flooring can be used in bathrooms and kitchens. The installation of solid hardwood floors should typically be left to the pros unless the homeowner has had previous experience installing solid hardwood flooring. Solid hardwood floor installation often requires special tools for blind nailing and fine cutting. In addition, the floor needs to be installed so that it can expand and contract freely. If not installed properly solid hardwood flooring can buckle and ripple. Engineered hardwood flooring has its unique benefits as well. First, it is usually less expensive than solid hardwood flooring, both in material and labor costs. In addition, engineered hardwood flooring can often be installed by do it yourself homeowners. Engineered hardwood flooring, due to its construction is also considered to be more eco-friendly than solid hardwood flooring. Engineered hardwood flooring is constructed out of several wood layers, with the top layer consisting of a high quality finished wood material. The lower sub-layers, however, are constructed out of lower quality scrap wood materials. As a result of reusing lower quality scrap wood products, engineered hardwood floors are considered to be “green” flooring products. Due the construction type of engineered hardwood flooring, e.g. many layers, they are more resistant to moisture and thus can be used virtually anywhere in the home, including the basement. Engineered hardwood flooring, versus solid hardwood flooring, will not buckle or ripple with exposure to low and even moderate moisture levels. Though there are many positives with engineered hardwood flooring, particularly from a cost perspective, it is however limited to the number of times it can be refinished. Most engineered hardwood flooring can only be refinished three or four times maximum before the floor has to be replaced. This said, engineered hardwood flooring lasts a reasonably long time compared to the average time the typical homeowner lives in a home. So when you are contemplating the pros and cons of solid hardwood flooring versus engineered hardwood flooring consider all of these factors carefully before making your decision. 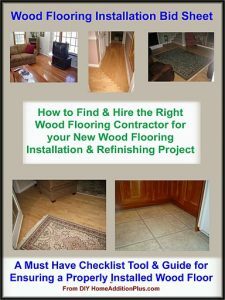 For help on finding a wood flooring installation contractor, see HomeAdditionPlus.com’s Wood Flooring Installation Bid Sheet. It will help ensure that you find and hire the right flooring installation contractor for your wood flooring project. In addition, it will help to ensure that your wood floor installation is completed on time and on budget. Should Hardwood Flooring go in before the Kitchen Cabinets? Fill out our 3-5 minute quick and easy form, and receive a free price quote on a house addition from one of our prescreened and licensed home addition contractors. This process is free and there is no obligation to continue once you receive your house addition price estimate.